The Summer has officially started and we have been making the most out of it. Rutland water is a great place to spend family time: there is a beach, lake, huge park and cycle paths. We had lots of fun and a yummy picnic too! Not forgetting a well earned ice cream from the lakeside cafe. The kiddies had fun making a pretend camp fire, they made us all sit around the pretend fire and it was like we were in the middle of the forest on a special camping trip. They explained how they did it all and who did what bit, which made us laugh. We then went to play in the park and eat an ice-cream, which was needed as it was super hot. It’s amazing how many hours we spent chilling at Rutland water. It’s a really nice location. 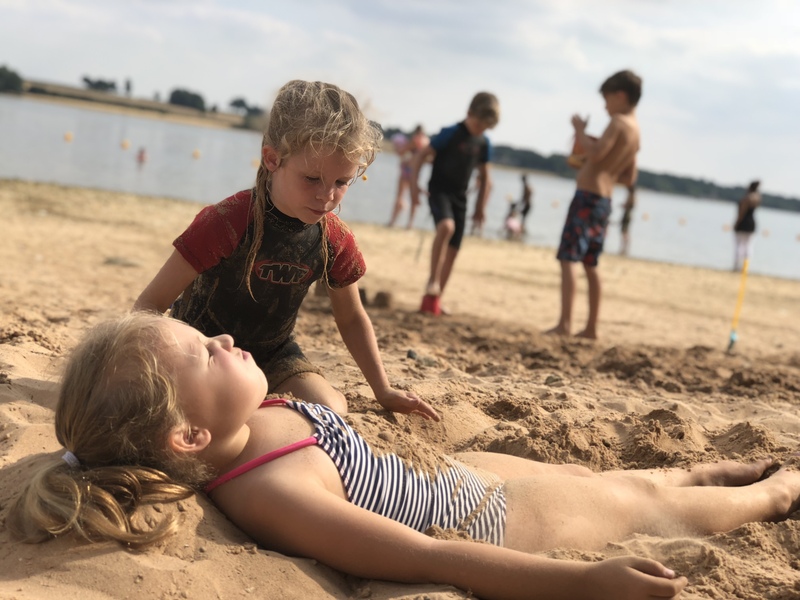 Noah and Isla went swimming in the lake, it was quite cold but I bet a nice, refreshing break from the heat. I love seeing the children entertain themselves, it’s nice that they get to use their imaginations too – making the campsite etc. There is nothing better than chilling out by the water to cool off on a hot summer day. Rutland water looks like a lovely spot. Is that in Nottingham? Sounds a great place and love their imaginations over the fire. Somewhere with water to cool off is just the ticket in this weather. I think it has been super hot over your way, just pleasant here. The grass looks so brown you can tell you haven’t seen much rain. Not great for the ground but perfect for summer holiday fun outdoors. nice for them to get to use their imagination, it goes a long way to a good day out. It has been to hot but a dip sounds a great way to cool off. I preder a nice ice lolly to ice cream I find it more refereshing.